This post is part of a new series from HuffPostTech that will profile a different social startup--from apps to services to websites--every day. Want to be featured on the site? Email us about your startup, which should have a social media component and be less than two years old, at bianca@huffingtonpost.com. A new business operating at the nexus of green and green is trying to do for dispensaries what Groupon has done for the Gap. Social couponer mmjDailyDeals.com claims it's found an audience of more than 10,000 subscribers since its February 1 launch. For now, the site is limited to the state of Colorado. What it is: A purveyor of coupons for "medicated carbonated beverages," "Banana Kush" and a wide array of other "edibles, smokables, accessories, hydroponic equipment, dining, and educational offerings," among other items. 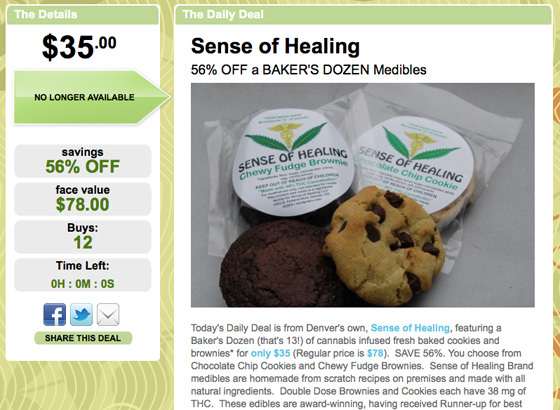 How it works: Much like Groupon, mmjDailyDeals.com sends subscribers an email every morning tagged to a zip code. One for Denver on Tuesday offered $27 off an eighth of an ounce of "top shelf" marijuana, bringing the price down to $23. Customers get a cut when they refer friends, and options to tweet or share the latest deals on Facebook are prominently displayed. Like Groupon, the company doesn't actually sell any product itself. The number of Facebook fans (210) and Twitter followers (52) so far are modest, but proprietor John Molinare believes "the social aspects of this are the dynamics that will make this grow very, very, fast." He thinks his subscribers won't be afraid to share the deals on the web with an audience that could include employers or grandparents. One note of caution for a company in an industry that depends on users' trust: although mmjDailyDeals.com included a Better Business Bureau logo as of Tuesday, it was not listed in the BBB registry. After an inquiry a company spokesman said the logo's presence on the website was a developer's mistake. The site will share personal information "for reasonable compliance with court orders." What are its competitors? Billed as the outfit venturing "where other social couponing sites won't dare to go," mmjDailyDeals.com is in effect competing against numerous more traditional advertising outlets. 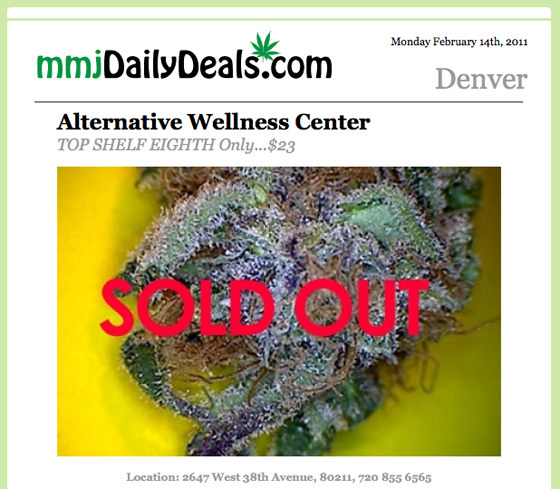 Alternative papers in Colorado rely heavily on medical marijuana ads to boost their bottom lines. Those ads provided for 15 percent of the free weekly Westword's revenues in 2010. Many dispensaries likewise have websites offering deals. Molinare isn't too worried the big players in the field -- such as Groupon and LivingSocial -- will challenge his small company, which he's funding himself. "Why would they?" he asks. "They've got a wonderful business going, without all the complications of medical marijuana." Will it expand? Molinare says he's had some initial conversations with potential funders about making the service sprout in other medical marijuana states. He has a background in marketing. But even though mmjDailyDeals.com doesn't actually sell any marijuana itself, there may be significant obstacles in expanding to places like California. Norton Arbelaez, the board chair of the Medical Marijuana Industry Group, says lack of financing options is problem, as is Colorado's solitary status as a for-profit medical marijuana state. Other states only allow non-profits to sell the green stuff. Would-be entrepreneurs outside Colorado have resorted to dubious tactics like paying themselves salaries unusual for non-profits, or overpaying "consultants." Molinare, the founder, is optimistic about securing more funding: "We think it is something we're going to have to address pretty quickly, but right now we're a startup, we see ourselves as revolutionary. We're good for patients, we're making medicine affordable."